David Brandt grew up in the East Bay town of San Lorenzo. He played trumpet throughout Elementary school into college and actually abandoned his trumpet in 1975. Married to a fellow educator he met in the Cal State Hayward Teacher Credential Program they raised 3 lovely daughters. He made his career in teaching at the elementary school level, first in San Lucas, CA for 5 years and eventually finishing with Santa Rosa City Schools at Biella Elementary -from which he retired in 2016. In 2010 he joined the Healdsburg Community band and slowly regained his ability to play. Eventually he also joined the big band the Windsor Jazz Ensemble and its smaller combo Life After Forte. Dave also likes to paint, golf, brew beer, travel, cook, work in the yard, and enjoy his growing family. Quinten T Cohen has played over 60 musicals in the Bay Area over the last ten years. Some of his past productions include Hedwig and the Angry Inch (Boxcar Theatre), The Rocky Horror Show (Ray of Light Theatre), Next to Normal (Spreckels Performing Arts Center), Hands on a Hardbody (Lucky Penny Community Arts Center) and West Side Story (Summer Repertory Theatre). Aside from theatre, he is a multi-instrumentalist and composer, playing with various ensembles as well as producing solo work such as albums, film scores and video game music. You can hear his music online at QuintenTCohen.Bandcamp.com. Born and raised in California… I began my musical ‘career’ in Woodland, playing coronet, in elementary and jr. high schools. When my family moved to Lake County, Lower Lake High needed Low Brass help, so I picked up baritone horn, transitioned to bass clef, and graduated into trombone. I enjoyed playing in a small dixie/big-band, as well as marching, jazz ensembles, concert bands, and musicals. I went on to pursue music at Santa Rosa Junior College, graduating with a business degree. At Sonoma State University, I put my horn away to focus on my true career. My horn stayed in the closet for 25 years, as I ‘didn’t have time’ for music. 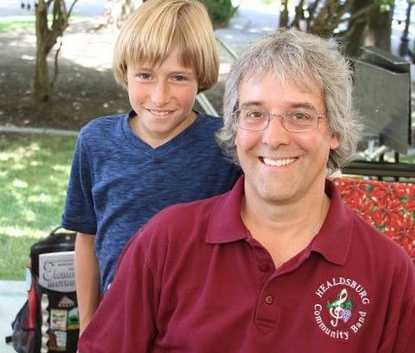 I was persuaded to join the Healdsburg Community band, and learned to ‘Make Time’ for music. I love playing with this talented group, and look forward to our weekly rehearsals. I’m currently Tubist with HCB, as well as Trombonist with the Windsor Jazz Ensemble. I encourage anyone who played in high school, and/or college, to dust off that instrument, and make time for music. Come join the Healdsburg Community Band… It adds fulfilling balance to your life. Linda is a retired Florida attorney who splits her time between Tallahassee, FL and Santa Rosa, CA. In Florida she plays with the Big Bend Community Orchestra and the Tallahassee Winds. She very much enjoys playing with the Healdsburg Community Band when in California. We're still learning how to properly hold our instrumentS!